There is only one cat in the photo! 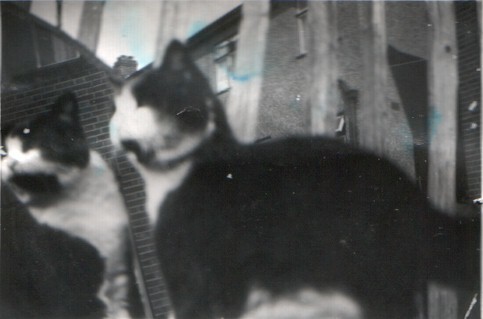 It is taken with the cat facing a mirror - I liked to experiment with photos and I think this was taken with an old Box Brownie type camera. Colour film was not really very common in those days - circa 1956. This is probably the only surviving photo (and one of the few taken) - snapped around 1956 at our home in Hornchurch, Essex, England. I can't remember too much about him or even how long he lived, but I do remember he used to sleep in my bed. Right in the bed under the sheets with his head next to mine on the pillow. Probably started my lifelong interest in cats.